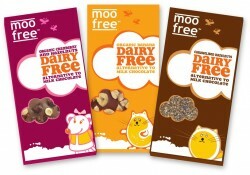 » Blog Archive » Visit To Moo Free Factory – Yummy! Visit To Moo Free Factory – Yummy! On a recent visit to the Moo Free Factory in Reading, Gecko met with Hammy Hamster who kindly gave us some of the delicious new flavours of dairy free choccie! There are three fabulous dairy free bars: Organic Cranberry and Hazelnuts, Organic Banana and Caramelised Hazelnuts – we’re not sure which to eat first!